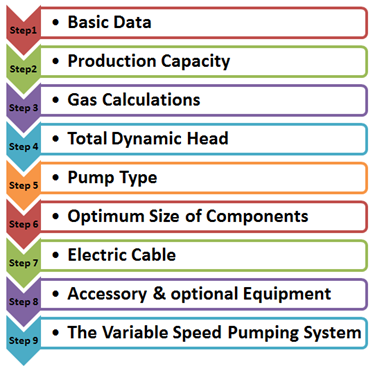 Centrilift has established a nine-step procedure to design the appropriate electrical submersible pump in order to have an efficient and cost-effective performance. This article gives an overview of the ESP nine step design procedure and outlines the procedure as a manual process to illustrate the design steps. Each of the nine steps will be explained in detail in the next articles. Specific examples will be worked through in each step of the ESP design. This nine step procedure is a basic hand-design of simple water and light crude oil. For more complicated well conditions, such as high GOR, viscous oil, high-temperature wells, there are many of available ESP design software (e.g. Prosper software – Product of Petroleum Expert; Pipesim software – Product of Schlumberger; Autograph PC software – Product of Baker Hughes; Solution Sizing Software – Product of General Electric; DesignRite Software – Product of Schlumberger). The fashion of use of each of these ESP design software will be presented and explained in detail in upcoming articles in our website.